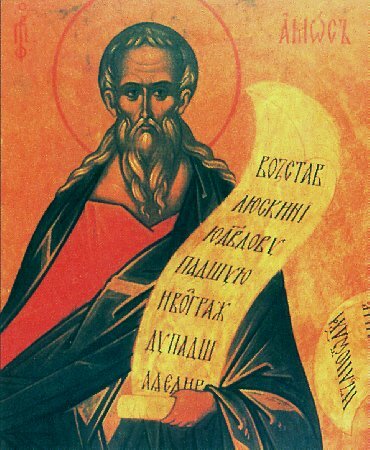 The Holy Prophet Amos, third of the 12 Lesser Prophets, lived during the VIII Century before the Birth of Christ. At this time the Hebrew nation was divided into two kingdoms: the Judean and the Israelite. The Judean king Hosiah ruled in Jerusalem, but the 10 separated Israelite tribes were ruled by Jeroboam II, an idol-worshipper. At Bethel he set up an idol in the form of a golden calf, which they worshipped, having rejected the True God of the Israelites. The Prophet Amos was a Judean, native to the city of Thekui. Simple and untaught, but strongly fervent of faith and zealous for the glory of the True God – the shepherd was chosen by the Lord for prophetic service and sent to the Israelite kingdom for the purpose of denouncing the impiety of King Jeroboam, and the Israelites for falling away from God. The prophet predicted for them a great misfortune, which would befall the Israelite kingdom, and the pagan nations surrounding it, for their impiety. Because of his denunciations, the Prophet Amos repeatedly suffered beatings and torture. But he again returned to Bethel, and threatening inevitable misfortunes, he continued to call the Israelites to repentance. The pagan-priest Amasiah of the idolatrous temple in particular hated the prophet. The prophet predicted for him and all his household a speedy destruction and for this he was subjected to a beating. The son of Amasiah, Hosiah, struck the saint on the head with a club and seriously wounded him. The Prophet Amos, still alive, reached his native village and there he died in about the year 787 before the Birth of Christ.